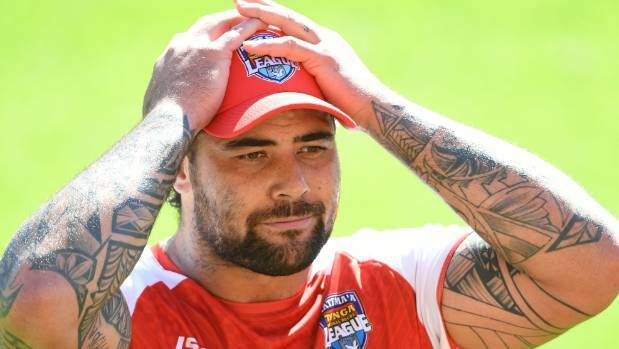 Andrew Fifita opens up about picking Tonga over Australia in international league. 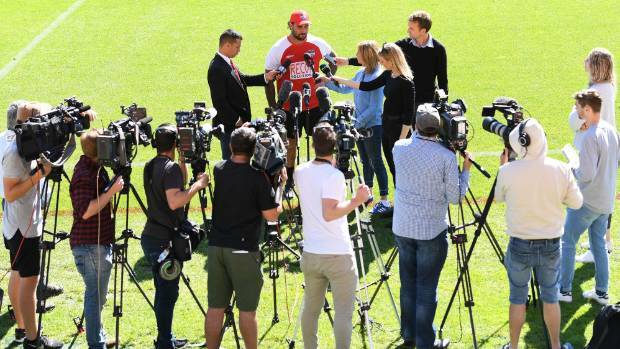 Andrew Fifita has taken a swipe at the Cronulla Sharks for failing to acknowledge his involvement with Tonga during speeches at the rugby league club's Monty Porter Medal night. And while the thought of coming up against his former Kangaroos teammates for the first time is yet to hit home, Fifita hopes a solid performance against Australia at a sold-out Mt Smart Stadium on Saturday will remind the rugby league world – and Sharks boss Barry Russell – what a force the tiny Pacific nation has become. The controversial prop also said his only regret about his high-profile defection from Australia to Tonga on the eve of last year's World Cup was the timing. Andrew Fifita will line up for Tonga against Australia at Mt Smart Stadium. 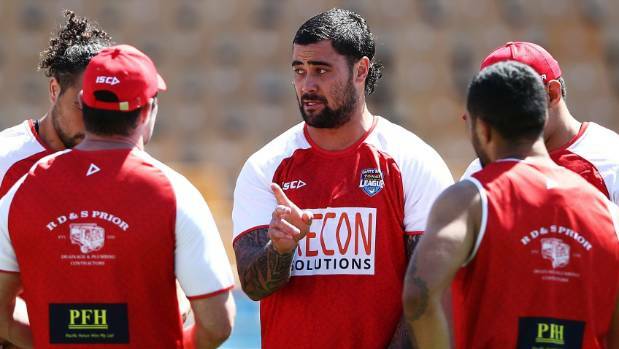 "If I was in the Australian team the club [Cronulla] would be proud that I was in it," Fifita said after Tongan training on Monday. Andrew Fifita is embracing his leadership role with Mate Ma'a Tonga. "I am still waiting for my Instagram post that I am playing for Tonga from the club. There's a little [dig] there. I guess most of the boys want to be acknowledged. "I remember our CEO [Russell] sitting there and giving all the credits to the Australian players and Junior Kangaroos, and I was waiting for my name to be called, just for representing on the international stage. "But there was no Tonga, no PNG for 'Chicko' [James Segeyaro]. I just wish our little tier-two nations could be recognised, too. It is still our international team and we want to be recognised." Tui Lolohea and Andrew Fifita are grateful for the fanatical support Tonga receives. Fifita may still be in the doghouse with his club because of his angry try celebration directed towards the coach's box during a match against North Queensland, and his expletive-laden podcast two months ago, which earned him an official warning. "[The celebration] showed the passion I take on to the field, I had a point to prove and when I was talking to Jimmy [Dymock], he told me as a fellow Tongan I wasn't running hard enough, and I said, 'I'm going to show him I run hard," Fifita said. "What better way to do it than get four points under the posts and get the lead for your team. International media interest in Tonga as the cameras prepare to turn again on Mt Smart Stadium. "It was all blown over by the next day. Jimmy would still out-wrestle me. As with the podcast, we were just three western Sydney boys from Mt Druitt, it's not a UFC podcast, it's three elite athletes having a say. "We should be allowed to have a voice, too. I say how it is, I wear my heart on my sleeve ... if I don't like you, I don't like you. You're not going to like everyone you meet." It's history now that Fifita joined UFC fighters Tyson Pedro and Tai Tuivasa on the Halfcast Podcast – along with a cameo from Sharks teammate Josh Dugan – and said, "You know you've made it when c.... hates you", told of the night he deliberately knocked over a row of fans' beers with his replacement card in Melbourne, and labelled prominent Sydney journalist Phil Rothfield a "f.....t". However, Fifita did not want any podcasts or past sins taking the gloss off the lead-up to the most-anticipated international match on the league calendar. Fifita, 29, said the decision to pledge his allegiance to Tonga had a lot to do with his father Sione and making a selfless move in his prime. "I thought about my dad and what he did for me as a kid," Fifita said. "He took me to every game and down the park to kick the ball around. "I told dad I would represent Tonga and his parents. He [was] in tears. I know how much it means to my family and me. "It hit home when we flew into Tonga. I remember sitting on the plane and 'Toops' [Daniel Tupou] looked at me and I was in tears. I know how much it meant for my grandparents and my aunty. It was a respect thing. "Mal [Meninga] was totally cool about it. It's exciting times. We're growing the international game in the right way. It's not about three teams any more. We challenged that last year. "We copped a lot of criticism at first. I have two nationalities. If you don't have two nationalities you shouldn't talk about how I'm feeling. Dad is grateful. He cries every time I walk out onto this field in the red jersey."